Dude, I love your art style on the characters. 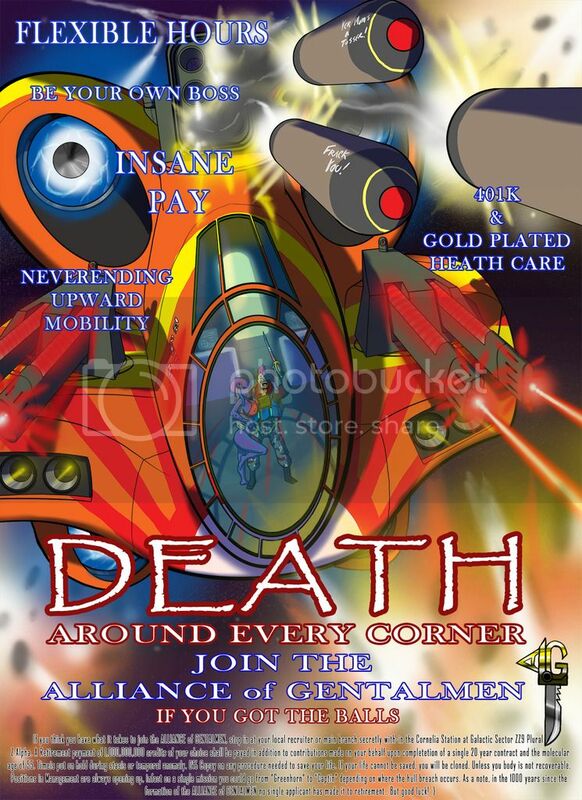 Yeah CS6 and a wacom.. try to knock these out as quickly as possible 1-2 hours max not my normal level of work or detail,, but I figure there supposed to be propaganda 2-4 color posters.. I missworded that last reply horribly. What I meant to say was: you went with the idea. Like expanded apon it and began working on them. UGH.. seriously been working on this one since my last post... not solidly mind you, but when i'm not at work. I added some fine print.. not as funny as they have been, but got some sci-fi reference in there.. 5 internet points if you can say from what. 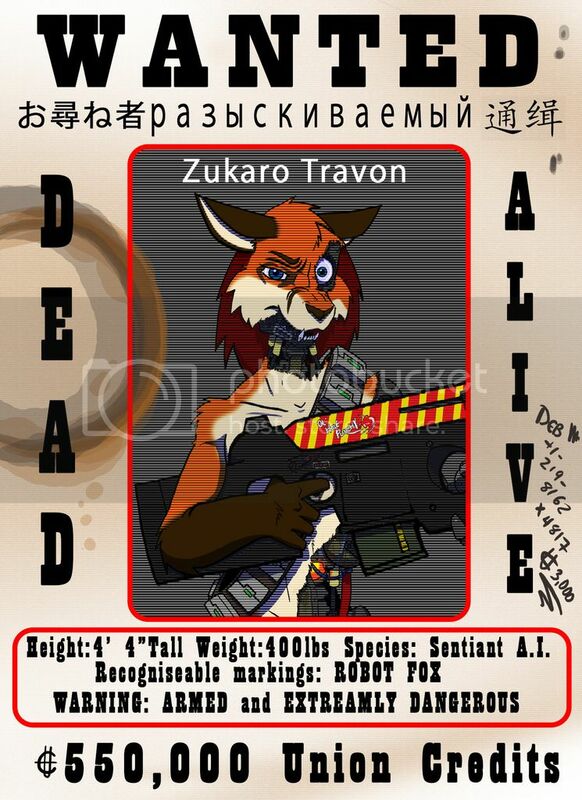 Welp, Wanted, Dead or Alive.. I'm sure for some sort of dastardly near-doing.. Something about a chicken genocide.. and indecent exposure with a jar of Nutella, The facts are unclear.. either way, 550,000 Union Credits! After a WD Corp remote mining vessel accidentally mistook his home planet for liquid metal. It in fact was a Sentient Living Metal, only Four 1 tonne weights were produced from the pure source, and used to hold down a tarp over the mining facility. The rest of his planet was quickly converted/smelted into Beer Kegs for the Anheuser-Shrub Beer Company. The mixing of un-sentient metals killing off the rest of his species. When he awoke he realized he now was the last of an extinct species and the villains had branded him with their unholy seal.. After forming a plan with his 3 other brethren it was agreed, he should leave the planet and reek vengeance against WD Galactic Corp.
240 years later a vessel landed on his planet, and he was able to convince the crew to take him aboard.. a lot of convincing.. at only 2 foot by 3 foot he is incredibly dense.. producing a small magnetic/gravitational field. "Dead Weight" as he's known, has no known name. He is neigh indestructible, impervious to heat or cold. and is again very heavy. 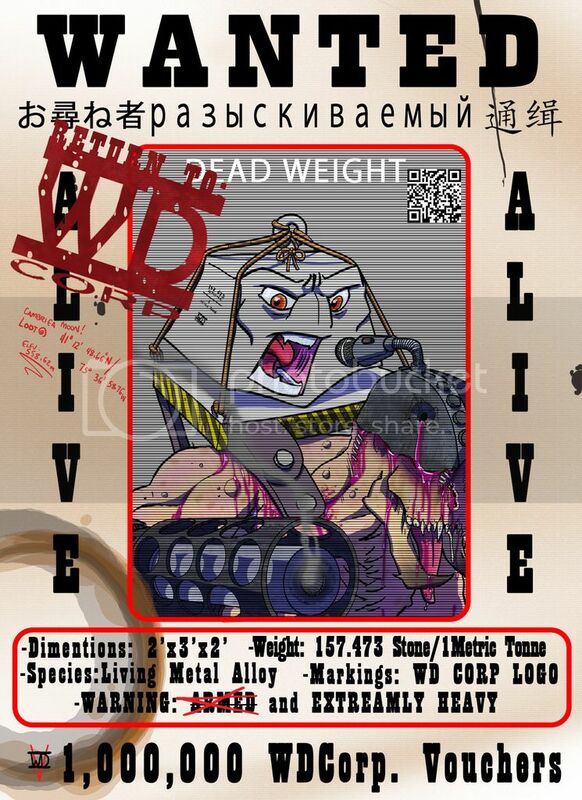 WDCORP has put a bounty of 1,000,000 WD Vouchers for the safe return of "DeadWeight" So that he can be re-united with his species at their research facility err.. Happy fun time camp.. If only there were likes on these forums, these things are amazing! DeadWeight4U wrote: LIKES!!! ALL THE LIKES!!!! You sir have my appreciation, and my gratitude. If there is anything you want from me, I would be happy to oblige.